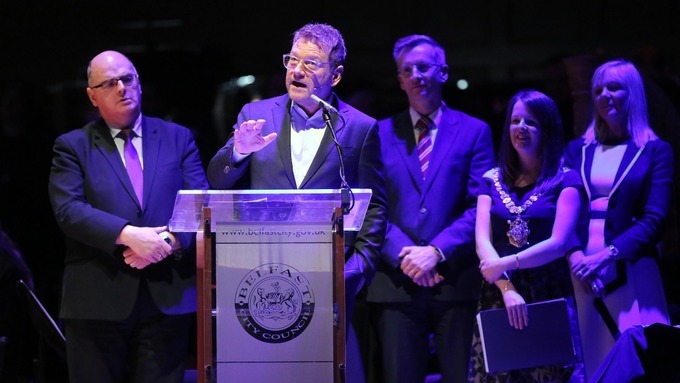 Actor and director Sir Kenneth Branagh, Harry Potter and the Chamber of Secrets‘ Gilderoy Lockhart, was recently awarded the Freedom of Belfast, an honor dating back to the 13th century that is bestowed upon individuals and organizations that have made significant contributions to civic life in his hometown of Belfast. Originally, the Freedom of the City was used to free respected citizens from serfdom and grant them certain privileges within a city. Today, however, the honor of Freeman is entirely symbolic and is typically given to valued members of a community or to visiting celebrities or dignitaries. My Belfast childhood was characterized by freedom. Here was a city, a big city to my child’s eyes, that always felt like a village. It seemed like you couldn’t get lost. Everyone knew you or someone who knew you. You can see and feel the limits of where you lived, and you knew exactly who you were – Belfast, working class, proud. To come back home, and receive the freedom that so symbolizes my experience of the city, is a humbling honor. Branagh began his professional acting career as Billy Martin in Graham Reid’s Billy trilogy plays that were set in Belfast. They were, however, his only performances portraying a character from Northern Ireland. Since then he has starred in and directed many popular films, including Henry V, My Week with Marilyn, Disney’s live-action remake of Cinderella, Dunkirk, and his most recent, Murder on the Orient Express. A pop-up film festival featuring many of these works is being held at multiple locations around Belfast to celebrate his achievement. It is very humbling and frankly amazing to follow in the footsteps of so many extraordinary people, including very fine artists and particularly, and especially last year, the nurses of Belfast, which I think was an amazing, brilliant, perfect choice from this city to honour people who do such an important thing and have done for so long. So that is a humbling thing to be mentioned in the same breath. I’m proud to say that you can take the boy out of Belfast, but you can’t take Belfast out of the boy. This honor is one among many that Branagh has received recently. Last year, he won the 2017 International Emmy Award for Best Performance by an Actor for his performance in the BBC drama series Wallander and was awarded the Albert R. Broccoli Britannia Award for Worldwide Contribution to Entertainment by the British Academy of Film and Television Arts. Hopefully, he’ll be able to find space for all of these new achievements among his already impressive collection of Witch Weekly‘s Most-Charming-Smile Awards. Branagh’s film Murder on the Orient Express was released in November 2017, and he recently confirmed that he will be continuing in his role of Hercule Poirot in the upcoming film Death on the Nile, based on another Agatha Christie novel. July 3, 2012 – The cover of The Casual Vacancy is revealed to mixed reviews. The page count is also revealed at 512 pages.